Q. How do I set up a group folder in Zotero so that the other users can add files and edit entries? How do I set up a Zotero group folder? Why can't my group members make edits to my Zotero group folder? Zotero's group libraries or folders feature allows you to share references with other Zotero users online. It's a great way to work on collaborative research projects. First, set up Zotero sync and synchronize your library. 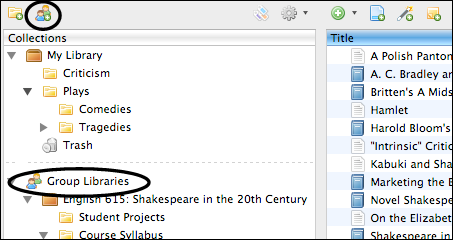 To create a shared library, click the Create Groups button near the top left of your Zotero window (small blue/green button with two “people” icons, second from the left). To join an existing Zotero library, search for it at zotero.org/groups or be invited by the group’s owner. You must log in to the zotero.org website to create or join a group. If you want to make sure that others can add files and entries, and edit them, make sure to either change their user status for the group after they accept the invitation or change the setting for the group library so that all members can make edits. See the video below for a demonstration of this process. You now have two sections in your Zotero collections pane: My Library and Group Libraries. Personal and group libraries are entirely separate, and changes made to items in one library do not affect the other. You can drag items back and forth libraries to copy items. Search for existing public groups or create a new group. Groups may be public (searchable, and anyone can join) or private (users can only join if invited).